On our second day in the Amalfi Coast, we divided our time between the bustling town of Amalfi and the sleepy town of Ravello. 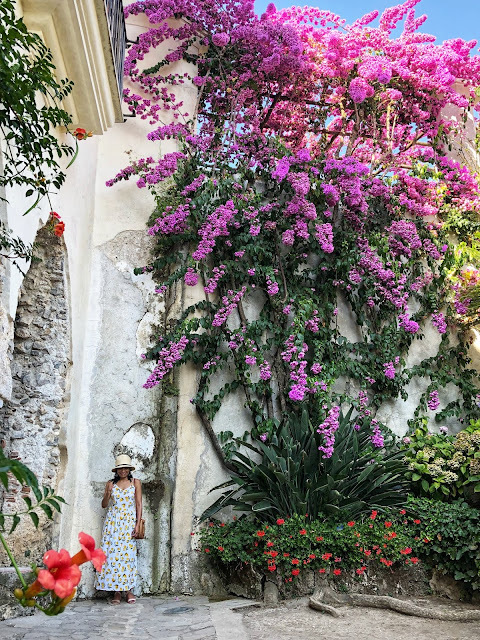 We spent more time in Ravello because we knew from our previous research that Amalfi is very crowded, especially because it was high season when we visited. 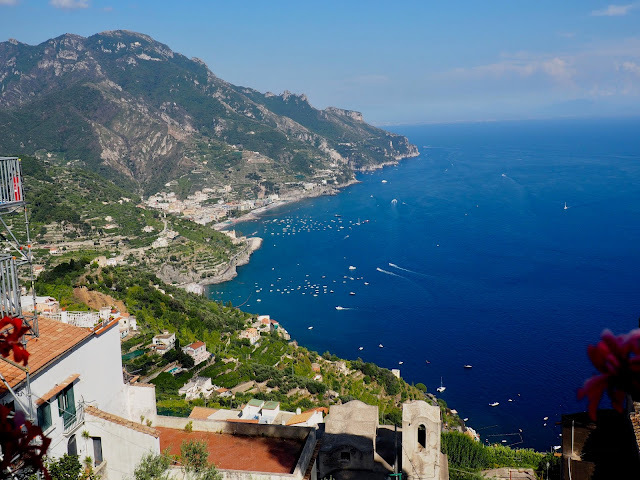 As busy and uncomfortable as it was (because of the warm weather), we couldn't give Amalfi a miss and therefore, we spent a few hours in the morning to explore the town. So, we hired a taxi from Praiano to Amalfi for €40. For convenience, taxi was our choice of transport during this trip. It actually saved us from the inconvenience of waiting for the SITA bus and fighting for seats, then potentially standing in the bus for the rest of our journey. Our first stop was at the Duomo di Amalfi Sant' Andrea Apostolo (Amalfi Cathedral). With a very modest entrance fee of €3, we were treated to an amazing baroque interior, beautiful cloisters inside and out, interesting religious artefacts and the relics of St Andrew the Apostle. I realised that as a first-timer, admiring the impressive facade of the church wouldn't have been enough because the very heart of the Cathedral is the crypt. Well, in my opinion anyway. 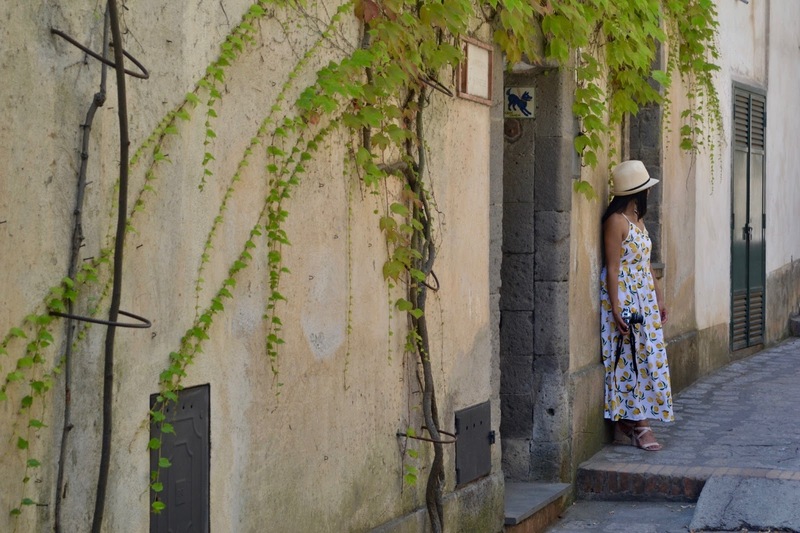 As we were already in Amalfi Town, we thought we'd explore the place a bit more, hence we walked down via Lorenzo D'Amalfi- the main shopping street in Amalfi. As expected, it was too busy for me to fully appreciate what it had to offer. 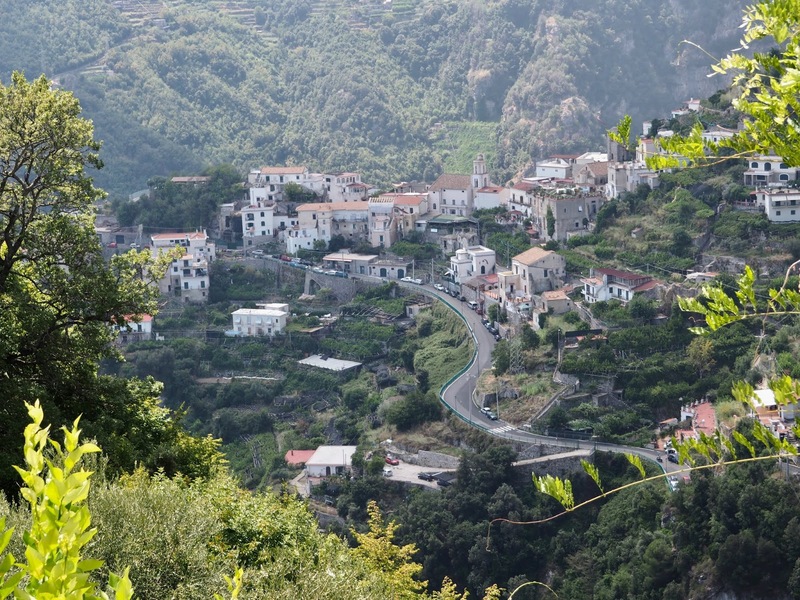 After more or less than a couple of hours, we decided to take another taxi to Ravello. I must mention that our taxi driver from Amalfi was Nonno Raimondo. He was this sweet old man, probably in his late seventies or early eighties. However, he was crafty too. We paid him €190 from Amalfi to Ravello, then Ravello back to Praiano. It wasn't bad for the distance I suppose, but my story about Nonno Raimondo doesn't end here. But let me talk about Ravello first. Without a doubt, Ravello is our favourite town in the Amalfi Coast. Set in a mountaintop, it provides breathtaking views of the sea and the coast below. The main square (Piazza Duomo) emanated peace and tranquility despite the presence of tourists and locals alike. Walking along the narrow cobblestone streets in the summer heat was refreshing. In Ravello, you must take your time to enjoy the relaxing atmosphere, the scenic beauty of the villas that line up the winding streets, the vines on rustic walls and simply the genuine positive vibes that this charming little town exudes. The walk uphill to our first destination was quite challenging, but we enjoyed it nevertheless. There were a lot of pleasant surprises along the way, like Villa Eva which wasn't on our itinerary but since the gate was opened when we passed by, we went inside without realising that it is actually a private hotel. We managed to have a little walk in their simple yet romantic garden, until someone spotted us and ordered for the gate to be closed. By this time, we were on our way out anyway. Lucky escape indeed. 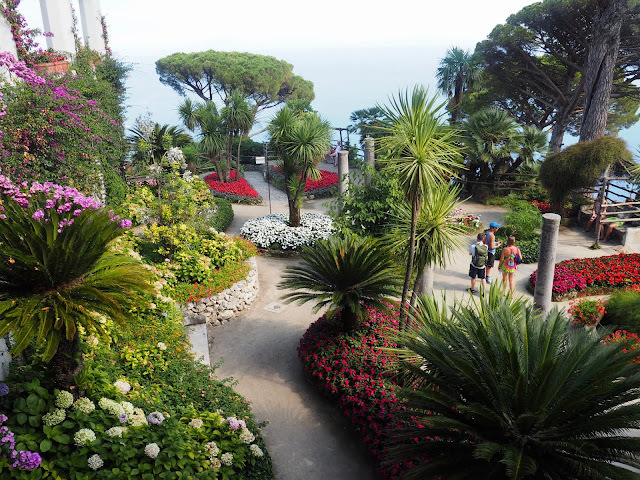 A few minutes walk from Villa Eva is Villa Cimbrone, one of the two villas on our list to see in Ravello. 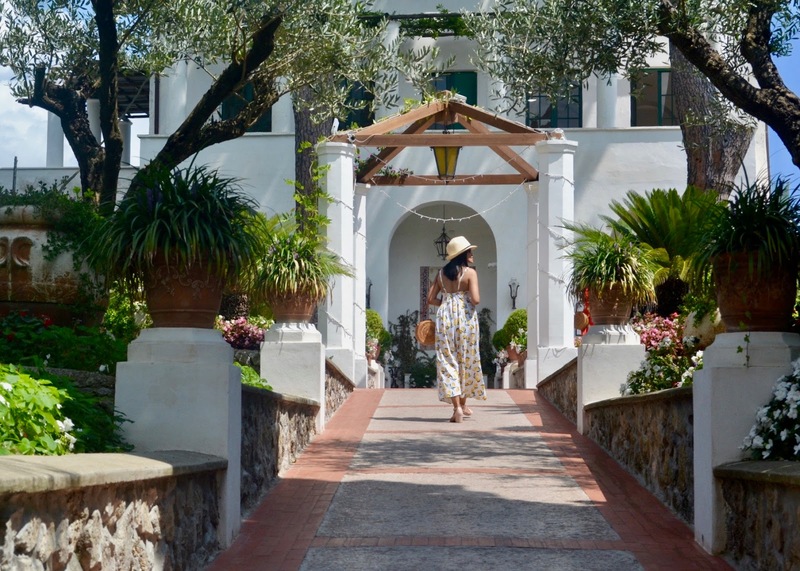 Villa Cimbrone offers beautiful sculpture garden and expansive sea views. The Terrace of Infinity which sits atop the cliff, overlooks the stunning Mediterranean sea. 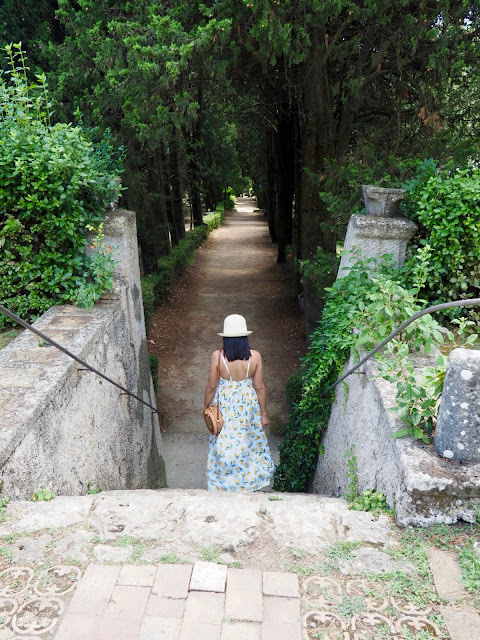 This enchanting garden is worthy of the challenging walk and the €7 entrance fee. 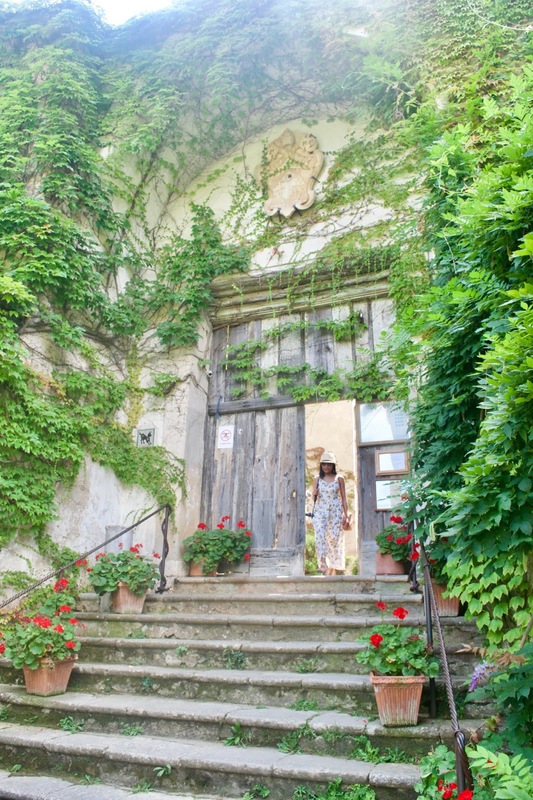 Just a few steps from Piazza Duomo, and about 15 minutes walk from Villa Cimbrone is the Villa Rufolo. This dreamy garden is perfect for photoshoots ala sweet escape. The explosion of colours makes a very pretty backdrop. Not to mention the magnificent views of the coastline. This picturesque garden is a must see in Ravello. Entrance fee is only €7, which is cheap compared to what Villa Rufolo can offer. I read somewhere that the best time to visit the villa is between May and October. We went in August and the flowers were in full bloom. 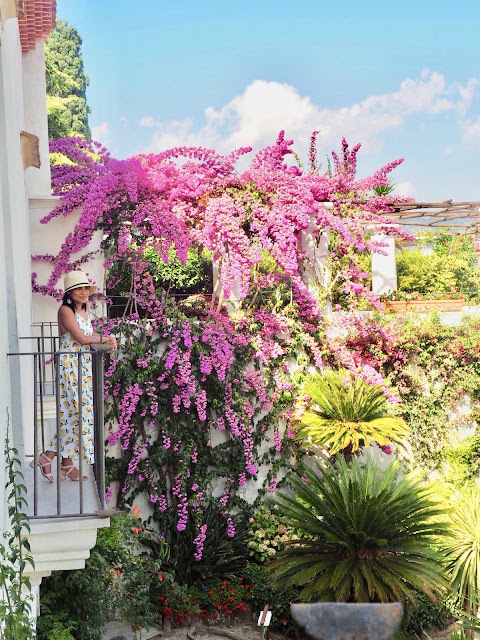 In fact, I found the bougainvilleas that I was looking for in this villa. - To be honest, I think this was the main reason why we wanted to visit Amalfi town in the first place. I mean, deep-fried seafood! Who would say no to that? A legit Italian street food place, Couppo d'Amalfi is a must-try in the Amalfi Coast. It is tucked away in a little corner in an alley just off the Amalfi Cathedral. We had the D'Amalfi for €12 and the Calamaro for €9. Everything was perfectly deep fried to crunchiness especially the shrimp, I actually ate the whole thing (yes- including the head, shell and tail). It was indeed pure deep fried seafood goodness! - We decided to have lunch at Villa Cimbrone's Il Flauto di Pan restaurant, however their main restaurant was closed at the time. We were given the bar menu and was offered a table in the garden instead. It was lunch with a view indeed and the food, although simple, was very tasty. We ordered the prosciutto and melon and the artichoke salad.